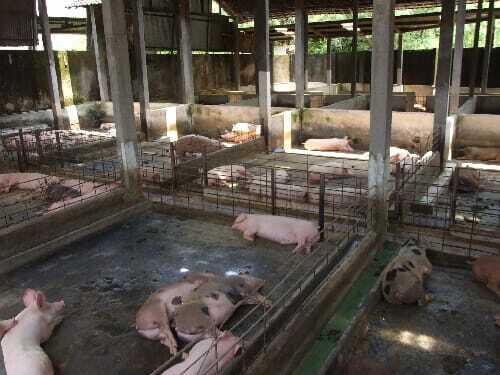 Stuart Lumb reports on his recent visit to pig farms in Indonesia, where there are more pigs than in Belgium or the UK, despite it being a predominanty Muslim country. EuroTier will soon be with us and farmers will be enticed into buying the latest gleaming equipment, all designed to save labour and to reduce manual effort. 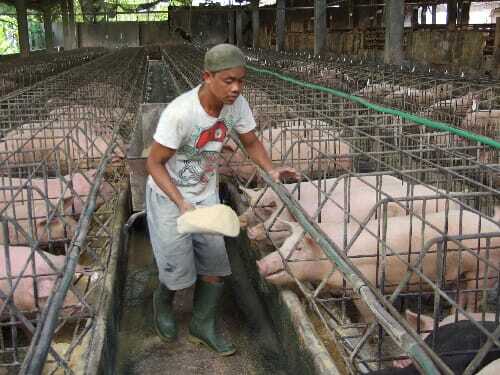 It is a sobering thought that many less affluent pig farmers cannot afford to mechanise their pig farms, plus it should not be forgotten that where labour is still abundant doing jobs by hand keeps men and women in employment. Indonesia is the fourth most populous country on the planet, with a population of over 250 million people. Indonesia is around 90 per cent Muslim but that still means 25 million are non-Muslim and who can eat pork – in fact, Indonesia has more pigs than Belgium or the UK. Also, Indonesia is a popular tourist destination for Westerners who also like to eat bacon, sausages and ham for breakfast whilst on vacation. The pig farm that the author visited was a 400-sow farrow-to-finish facility situated on the island of Java and had been built 20 years ago. The buildings had very high roofs in order to allow air to circulate. Many of the pens had solid floors with a sunken gully at one end. The pen floors get washed down frequently, with the manure ending up in the gulleys. Thereafter, the manure flows by gravity underground and seemingly ended up in a nearby river. The farm employed 27 staff, a huge number by Western standards but given the fact that nothing was mechanised, then that number of people looking after that number of pigs was hardly surprising. Also, this policy provides employment for men and women in the village. Most of the feed rations, which were based on ground corn, soybeans and rice bran were simply mixed by hand with a shovel in a large feed store, the resulting feed being shovelled into bags, which were carried round to the pig pens. The bags certainly contained much more than 20kg – red tape regarding lifting heavy weights has certainly not reached rural Java yet. A vitamin and trace mineral mix is bought in and synthetic lysine is used in some rations. Mycotoxins are always a problem in tropical climates and so Mtox plus, a toxin binder made by French company Olmix, is included in the feeds. The farrowing crates were raised above ground level and had metal slatted floors. The lactating sows were fed on dry meal and the same diet was given to the gestating sows, which were housed in stalls. The farrowing pens were all raised about one metre above floor level which meant sows had to be persuaded to climb a ramp to access their maternity facilities. Labour was plentiful so assistance was always on hand, to help difficult sows. Old hessian bags were laid down to prevent the new born piglets' legs going down between the metal slats and despite the heat, creep lamps are the norm. Newborn piglets were dunked in a bucket of Mistral, another Olmix product, at farrowing. This dries the piglets up, so energy lost through shivering is reduced, and the time they take to get to the udder and suckle the all important immunoglobulin-containing colostrum is also reduced. Piglets are teethed, tailed, iron-injected and castrated. The custom here is not to cut the tails; instead, the tails are tied off with very thin string. Weaning is late by European standards and takes place at five weeks of age, with output standing at 16 to pigs per sow and year. All sows are served twice naturally using Pietrain and Duroc boars, sourced locally. The high temperatures can affect sperm quality and quantity and this undoubtedly is reflected in the farm's productivity. Sow performance and service data were all recorded on a very large wall mounted white board. The farm is managed by Siradjuddian Yahya, who hails from Afghanistan. Mr Yahya has been manager for the last four years. He is a Muslim and of course does not eat pork but has no problem working with pigs. “We have a slight scour problem, but fortunately no signs of PRRS or PCV2,” he said. Some of the weaner pens had fully slatted floors, with slats made of steel. Feed was provided in simple steel trough shaped feeders. Finisher pigs were kept in solid floored pens, kept clean by being swilled down frequently. Pigs are slaughtered at around 110kg and the procedure for handling slaughter pigs was simply amazing by Western standards. Each pig was enticed into a sausage – shaped wire cage, closed at both ends. A stout pole was then slid through the cage to enable the pig to be carried by two strong pig workers. The pigs are cared for lovingly as there was no struggling or squealing whilst this operation was carried out. Next, the pigs were carefully placed on an old-fashioned weigh scale and the weight of each pig was recorded in a large notebook. No computers to be seen anywhere. 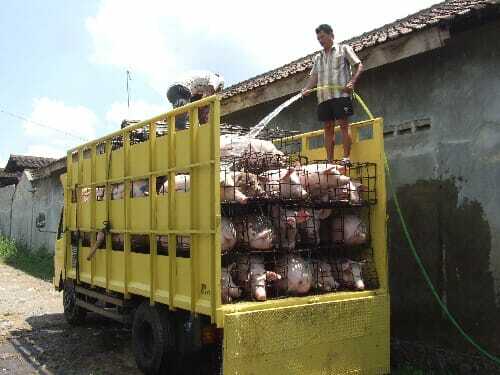 After weighing, the pigs were carefully loaded on to a large truck – no pig transporters with hydraulic tail gates here – and liberally hosed down with lots of water, as the air temperature was in the region of 30°C. The pigs are slaughtered in Jakarta, which is a 10-hour journey and given the heat and the journey time the killing out percentage must suffer drastically. A second farm that was visited was using Hampshire- or Duroc-cross boars along with Pietrains. In addition to day-time feeding pigs were fed in the evenings. It is cooler then, of course, and pigs will eat more readily at that time of the day. A very unusual feature of the farm related to the housing of the finishing pigs. The farm had 345 small crates which housed finishing pigs, which were fed individually. The author told the owner that this concept was also popular in East Yorkshire – but back in the 1970s. All the pigs are notched and days to slaughter can be calculated and traced back to the boars used. A third producer whom was visited was using AI. Numbers born alive there stood at 11 and nine are weaned per litter, on average. Unit output was 21 pigs per sow and year. This producer was also using Mtox+ and Mistral, to good effect. He also remarked that using ractopamine is allowed in Indonesia, along with beta-agonists. These were fascinating visits and the author wishes to thank Olmix for giving him the chance to see such amazing pig farms.